Protection from ticks and mosquitoes is important for your child! Today is beautiful, and I hope most of you have your children outside at some point! Children both love and NEED to be outdoors. Outside activity is an important part of a healthy child’s life, and it helps children get good and tired too! I know one of the biggest reasons I encouraged outdoor play was that it provided me with a good long nap from my children in the afternoon. A method to my parenting madness! With spring and summer upon us, the pesky bugs will soon be too! Not only are these insects just plain annoying, they can carry dangerous diseases to your children. Most children have mild reactions to bug bites, but some children (are they just sweeter?) really seem to attract those insects and those bites result in large red welts that make them miserable. West Nile Virus, Lyme Disease, and Rocky Mountain Spotted Fever, and the recent outbreak of Zika Virus are diseases that could result from insect bites too. So, if we want our children outside and we don’t have a protective “bee suit” in the house…what are we to do? The use of insect repellents are recommended by the American Academy of Pediatrics and the Center for Disease Control. Although most of us hate to put chemicals on our children, DEET used correctly is one of the best protectors for your child. The amount of DEET in insect repellents varies from less than 10% to more than 30%. Studies show us that the higher concentrations of DEET protect for longer periods of time, but not more effectively. So a repellant with 10% DEET will protect for about 2 hours, 24% about 5 hours, and at over 30% there is very little increase in protection. The AAP recommends using a concentration of DEET between 10 and 30 percent. Most of our children will not be outside in an area with biting insects more than 2 hours at a time…so 10% DEET should be enough the majority of the time. Do not use a concentration of DEET greater than 30%, usually 10% will be adequate. Only apply the repellent to the outside of your child’s clothing and on exposed skin. Use a small amount just to cover the area, thicker layers are not more effective. Do not spray repellents on your child’s face. 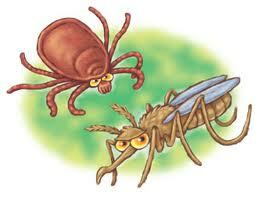 Put the repellent on your hands and rub on your child’s face being careful around eyes, and mouth. Do not put repellent on your child’s hands. Do not apply to open areas like cuts. Spray repellents in open areas, do not breathe them in. Wash your child with soap and water to remove the repellent when he comes inside. Wash your child’s clothes before he wears them again. Do not use sunscreen/insect repellent combinations. You will need to reapply the sunscreen and the repellent should not be reapplied. Cover your child’s exposed skin with long pants and sleeves if you know he will be in an area with a lot of biting insects. This will decrease the skin area that will need repellent. Try to avoid dusk, the “buggiest” time of day! Remember DEET is NOT effective on stinging insects like bees and wasps. Permethrin is a chemical repellent. It is effective and should be applied to clothing only, or items like tents, not on skin. Use in concentrations of between 5 and 10 percent. This repellent will kill ticks on contact. Great for spraying on tents and sleeping bags. Picaridin is as effective as DEET and some studies show it may be less likely to cause skin irritation in children. It has been used in Europe for many years, more recently here in the U. S.
2% soy bean oil and lemon eucalyptus has been shown recently to be as effective as 10% DEET. Lemon Eucalyptus Oil is not approved for use in children under the age of 3. Cedar, and Citronella essential oils are less effective and give very short term protection. So the bottom line is, insect repellents are a better alternative that the potential complications from a disease carrying insect. Be smart and use repellents safely. Protect your child with clothing and by avoiding the time of day/night and areas where insect bites would be more common. Check your child for ticks daily and remove any tick with a tweezers and clean with soap and water. Lastly, put this at the bottom of your worry list….outdoor fun is essential for children! Protect them with common sense and enjoy the outdoors…don’t let the bugs scare you off! ← Get a little dirty…it is time to garden!